The line we joined at the security checkpoint was at least 50 yards long, although it went faster than I expected. The line for the front gates was about the same, and it sped right along, as well. We only had the length of Main Street, USA between us and the Plaza Inn. What we had not reckoned with, though — and this was a rookie-level mistake on our parts — was the “rope drop.” Disneyland had not yet begun its operating day, but was open as far as the Hub, which brought guests out of the esplanade, and allowed the shops on Main Street get a jump on merchandise sales. Masses of eager humanity were gathered in the Hub at the turning off points for the various lands, ready to run and elbow their way to the front of the line for Space Mountain or Peter Pan’s Flight or Haunted Mansion. That moment of releasing the crowds into the park en masse was the rope drop. For us, that also meant the gathering for Tomorrowland was clustered in front of the entrance for the Plaza Inn. We arrived at the back of the throng, which was shoulder-to-shoulder, with no apparent path through. I shrugged and settled in to wait. The rope drop was about to happen any moment, and we could just flow with the crowd straight to our breakfast. Amy chose a different tack. With a steady stream of “excuse me,” and “sorry,” and “we have a reservation at the Plaza Inn,” she plunged in. I disliked the thought of slithering through everyone, but I followed. It seemed the best course of action. If Amy were to arrive without me, the teasing potential from my brothers would reach near-historic levels. It did not take as long as I feared; people shuffled around and made space. As we got near, though, and as Amy was explaining “we are just going to the Plaza Inn,” one guy called a reply: “Oh yeah? Is that what you say to get to the front of the line?” It was sassy and cheeky, but good-natured, and I could hear the laugh in his voice. Amy, though, was not in the market for sass or cheek. “No, you just watch us as we walk in there,” she fired back over her shoulder as we went. I was not aware of the extent to which our late start had raised her stress level until I heard the sharpness in her voice. In the same instant were crossing into the Plaza Inn, I heard our friend call back: “I was just joking.” He sounded surprised. Our entire traveling party was gathered in the entry patio of the Plaza Inn, waiting for us. We had arrived, but it was a few minutes past the reservation. Everyone seemed a little harried. We were clearly not in the running for the coveted “Favorite Children” title that day. For the first several decades of operation, the food in Disney Parks was an afterthought. Dining was not considered an attraction; it was something to keep the boiler going. If you were spending a day in Disneyland and wanted an alternate to the standard hamburger or hot dog, you could swing by the pirate ship for a hot tuna pie, which sounds like it should be a joke, but is not. Once management realized that people were making dining a bigger part of their vacations (boats were bottoming out on “it’s a small world”), they began overhauling their food services. New menus and new restaurants fed the interest. As improbable as it sounded at the time, the food began gaining a reputation in the fan community as being maybe… well, good. Disney ran with the positive response. 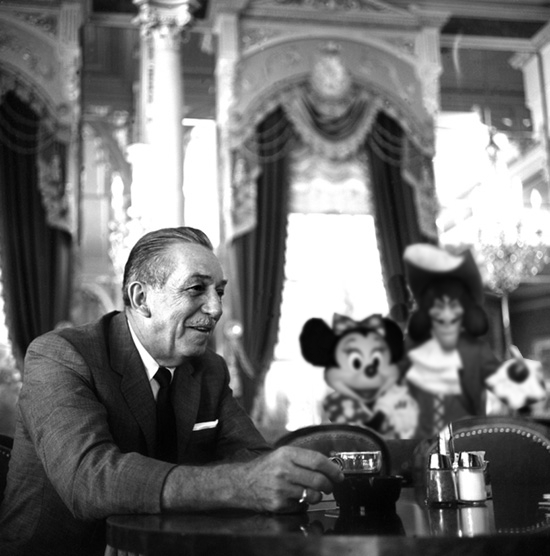 Much of my understanding of the history of dining in Disney parks is peripheral and conjecture. I was the following ages for my first five trips to Disneyland: 4, 8, 12, 18, and 26. By the time I started caring much about where we ate, the parks were deep into the revolution. I have since made up for that early disinterest by caring a bit too much about the food. This is not a niche interest, either. The dining has its own section on the official Disney park pages, with a write-up for each restaurant. Every Disney fan website and blog I read has sections and posts about food, including a few that are exclusively about dining, like the excellent Disney Food Blog. Even the menus of landmarks like the venerable old Plaza Inn (formerly named the Red Wagon Inn, back when Walt Disney liked to take morning coffee there) are not immune from the attention and tinkering, and old favorites sometimes go the way of the hot tuna pie. Even fans that visit the parks multiple times in a year will arrive to find unexpected changes. If there were a lesson in any of this, it would be about savoring great moments, as they may never happen in quite the same way again. But there probably isn’t a lesson. The Minnie and Friends breakfast experience at the Plaza Inn is a fixed-price meal, where you can enjoy standard American fare: eggs and pig-based meats, waffles, pastries, and custom omelets. The food is served in what Disney calls “all you care to eat,” drawing, I guess, a moral boundary for anyone who might like to see how much they can eat. Minnie and Friends is not a self-serve buffet, but rather attendants are stationed behind a counter, dishing for you. I stepped up to a serving rail and watched a short, stout, middle-aged woman fill a plate with scrambled eggs, a few slices of bacon, a couple of sausage links, and a slab of hash browns. It was a delightful plate of food. It reminded me of something you might see on one of those commercials with a serious-voiced man saying: “Does this look like a good breakfast to you? Well, in 90% of the world, this would be all the food a ten-year-old child will eat in a month,” followed by horrifying images of starving children and a pitch for your charitable donation. She paused, let out a long, slow dear-lord-give-me-strength sigh, and put one more sausage link and two more slices of bacon on the plate. I could feel myself shrink away from this woman’s unexpected displeasure. I told myself that I was the paying guest, and the dining format was all I cared to eat. I cared about eating bacon. “Can I please get at bit more bacon?” I struggled to sound casual and uncaring. Her eyes narrowed. Without breaking eye contact with me, she dipped into her large, full serving tray for a single slice of bacon (she even had to shake her tongs a little to disentangle it from another piece). I had a brief flash of psychic prescience that she would snap the strip in half before dropping it on my plate, which did not happen. I am certain she considered it, though. She shoved the plate up onto the serving counter before I could interject further. My ears were hot as I retrieved it. I did not like feeling embarrassed for my gluttony, although perhaps that was her point. Why should I ask for more FOOD to stuff into my FAT FACE? I went outside to where our large group was holding court over half a dozen tables. Amy and I were at one point of a triangle made by Josh and Stacie and their kids, and Jake and Valerie and their daughter. Mom and Dad were at our table, chatting on and off with us, and happy to be in the crossfire of their grandkids’ attention. Rich, Hydee, and Matt and Wendi were next to us, working hard to keep Dorothy’s attention on her breakfast. The first costumed visitor of the “Minnie and Friends” breakfast was, oddly, Captain Hook. It made me wonder how much Mickey knows about their “friendship,” and if he is comfortable with the arrangement. A peek behind the scenes before the start of another busy day. I always think the costumed cast members at a character meal must be miserable, weaving through a dining room dressed as Winnie the Pooh or whoever, hugging sticky kids, sweat stinging their eyes, posing for multiple pictures, often at the whim of horrible, demanding parents who want their squalling little monsters to look just right. It seemed everyone in our group was sensitive to this same suspicion, and so the parents among us had their kids say hi, took a quick snap, and sent the character along with our thanks. After the extraordinary and amusing hour, our breakfast ground to a halt. I did not return to the line for more food. The meal itself was fine – neither the best nor the worst breakfast we would eat that trip – but the company and the conversation made it memorable. Best of all, we emerged from the Plaza Inn patio, already in the heart of Disneyland Park, with full bellies and a long day ahead of us. 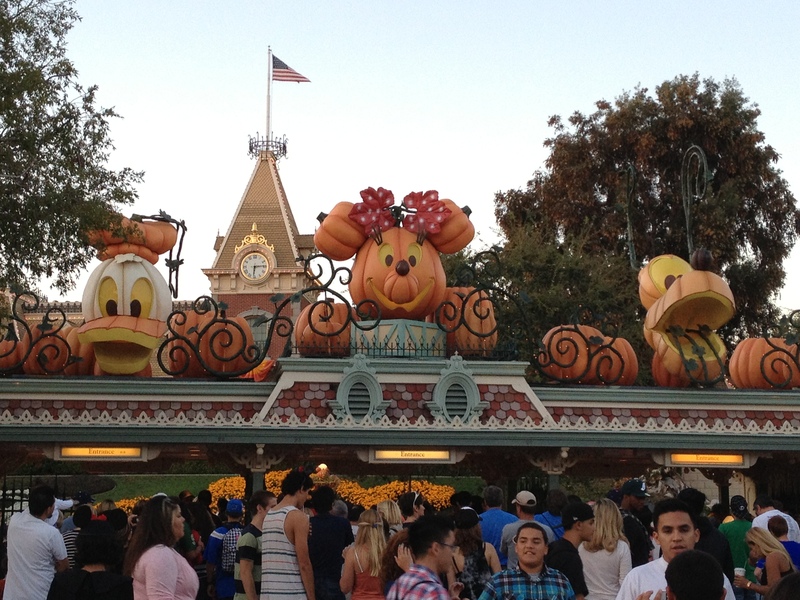 It felt like a typical summer day in Disneyland, which, being fall, was not a welcome thing: it meant the temperature was 10 to 15 degrees above average and the park was crowded. Our group had splintered with different agendas as we left the Plaza Inn, which was the only logical thing to do with 17 people. Amy suggested the two of us dive into Tomorrowland and I agreed, even though I was already scowling at the teeming masses around us. The one consistent draw for both of us in Tomorrowland is Buzz Lightyear Astro Blasters, which is quite close to the Hub. We drifted past the queue, checking the wait time, which was already a robust 30 minutes. The ride mechanism for Buzz chews through lines in a hurry, so we skipped by, knowing we would see shorter lines. With six more days in the park after today, we were not in a rush to ride anything. Right next was Little Green Men Store Command, and we stepped in to check their pin trading board, noting with a tut-tut that much of the counter area was dinged and marred, and the entire space could stand to be freshened. This is one of the few stores in Disneyland attached to the exit queue of a ride, as is common in Walt Disney World, so it sees heavy traffic. The Little Green Men store is always in a state of chaos, with merchandise scattered on the floor from curious children (and lazy parents), and an air of the-inmates-are-running-the-asylum. We drifted around Tomorrowland and into Fantasyland, where far from a respite, we found an increase of people. The Storybook Land Canal Boats ride was closed for repairs and not going to open while we were there. 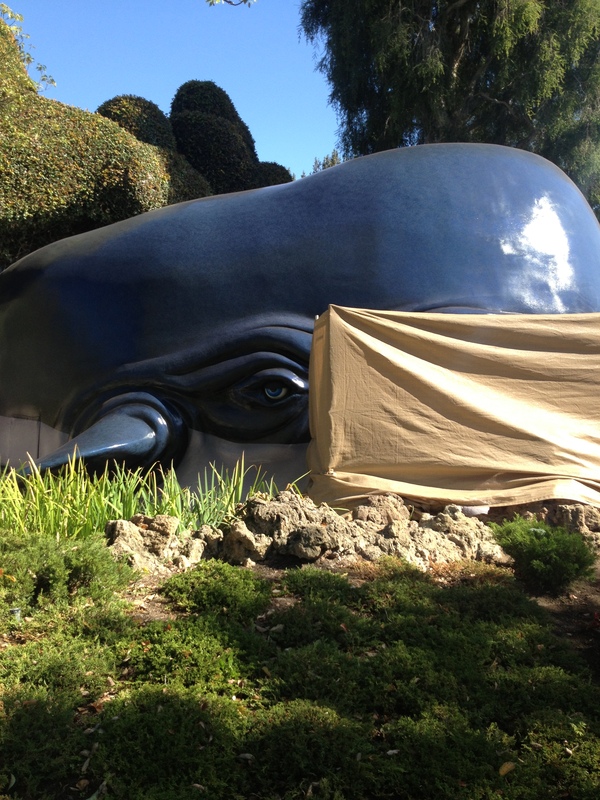 Amy was disappointed — Storybook Land is one of her favorite rides — so instead she took a photo of the whale-mouth boat entrance covered with a stretched tarp framework as if Monstro were being prepped for dental surgery. Monstro’s toothpicks are the size of little wooden boys. After passing on the crowded Buzz we had also skipped the Matterhorn as the line stretched well around the mountain. The dark rides in Fantasyland were all unthinkable. We continued past the Big Thunder Ranch and into Frontierland, the heat and crowds making us indolent. Big Thunder Mountain was posted as a 45-minute wait, although I secured a FastPass for later use. The broad intersection in front of Pirates of the Caribbean where Frontierland and Adventureland converge into New Orleans Square was so dense with people that I could not see any of the tarmac. We weeble-wobbled our way through the crowd and to the “Magnolia Park” fountain in front of the New Orleans Square train station. While this pleasant, shady area can often be quiet and tranquil, it was, of course, dense with people. In that area we happened upon Mom, Dad, and Grandma sitting on the walls with Stacie and Josh, while Lexie and Jaden frolicked nearby. They were squeezed hip-to-hip with strangers, something no adult in their right mind does unless compelled by circumstance. We stopped for a few moments to chat, and, like the mindless tourists we were, could only talk about the teeming masses and the heat. The current park gossip — overheard in the crowd — was that Disneyland had initiated their crowd protocol and were only letting people in as others exited. I never bothered to confirm that, but it was not difficult to believe. After a quick stop to make plans for later that evening, we leaped again into the miasma. It was time to eat lunch, even though it had been just four hours since we left the Plaza Inn and neither of us was particularly hungry. However, we were determined to not skip a meal if we could help it, which — and we understood this at the time — is one of those appalling decisions one makes on vacation. Amy suggested we eat at Rancho del Zocalo Restaurante in Frontierland, thereby proving, conclusively, that she loves me. Rancho del Zocalo is a pleasant corner in a relatively quiet part of the park, featuring a shaded hacienda-style patio, colored glass lanterns, and quiet guitar music. The food is described in the official park literature as “classic Mexican cuisine,” and although they make no claim of authenticity, I am sure grandmothers in Oaxaca would laugh themselves silly at that. A more apt description might be Tex-Mex: Americanized burritos, tacos, fajitas, and their delicious kin. 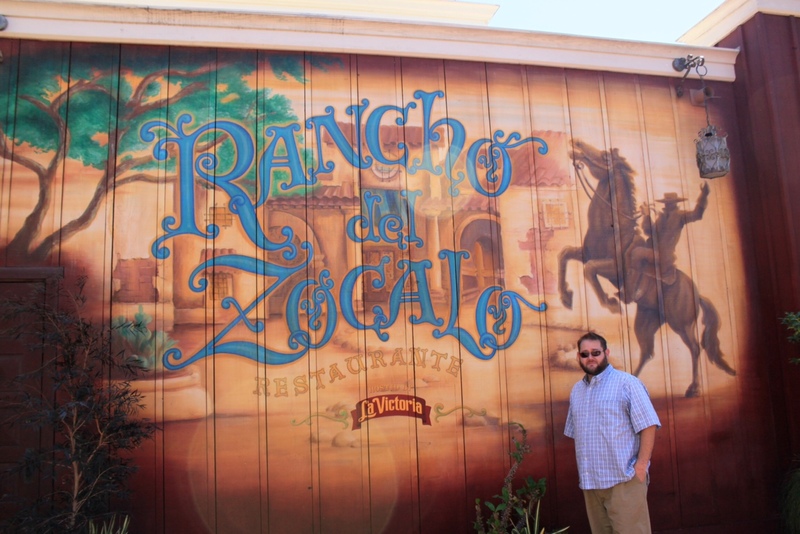 As my favorite restaurant in one of my favorite vacation destinations, an argument could be made that “Rancho” (my preferred abbreviation, although I also go with “Ranchodelzocalo” spoken in a single word) is my favorite dining experience in the world. It would certainly be in the conversation. The theming at Rancho Del Zocalo is very subtle and understated. I prefer to sit on the north side of the Rancho patio, which overlooks the final stretch of track for Big Thunder Mountain as it arrives at the loading station. We got our food; I ordered the beef tostada salad (“bwahahaha” laughed Josefina Romero, 67, of San Pedro Potchutla), found two ideal seats, and got started. It took a few minutes for us to realize that the trains were not operating. We watched ride workers scrambling around and listened to calming announcements over the loudspeaker. Eventually, the entire operation was evacuated, including the riders stuck in the trains. We enjoyed the drama from the shade of the patio. After stuffing ourselves for the second time that day and obtaining unnecessary refills for our sodas (Rancho is one of the few places in either park that allows it), we decided to head over to Disney California Adventure. Sure, Cars Land would still be packed, but perhaps the crowds in general would be a little more manageable. That was our hope, anyway. DCA was just as hectic, even without venturing in to Cars Land. We wandered into Condor Flats to gather FastPasses for Soarin’ Over California, which we then promptly forgot about. The path took us to The Little Mermaid: Ariel’s Undersea Adventure, which is a charming attraction with great animatronics, but a terrible name that was probably the result of a squabbling committee. We took advantage of the fast-moving line to move our tally so far that day to meals: 2, rides: 1. 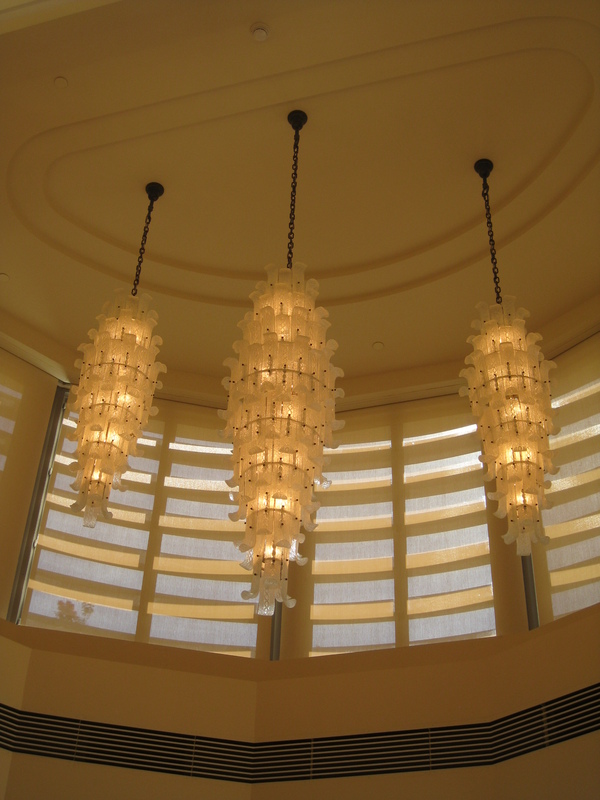 Pro tip from Amy: when the crowds get really intense, take pictures of the light fixtures. After our air-conditioned journey with Ariel, we gave up on ride queues and devoted the rest of the afternoon to strolling paths, people watching, looking in stores, checking for pins, and contemplating treats. As the lights began to come on for the evening we left to go back to Disneyland. Our plan that evening was to meet up with our traveling party for the 9:00 showing of Fantasmic! Our group is the sort where everyone loves the multitude of parades, performers, light shows, water shows, and fireworks that Disney parks have to offer. I am a bit of an outlier. My stance on these extravaganzas varies from park to park, and even from show to show. For example, I enjoy Fantasmic! and do not mind spending an evening to see it, but it would also not ruin my trip to miss. That is the “like” end of my spectrum, along with World of Color in DCA and a handful of well planned and well produced others. 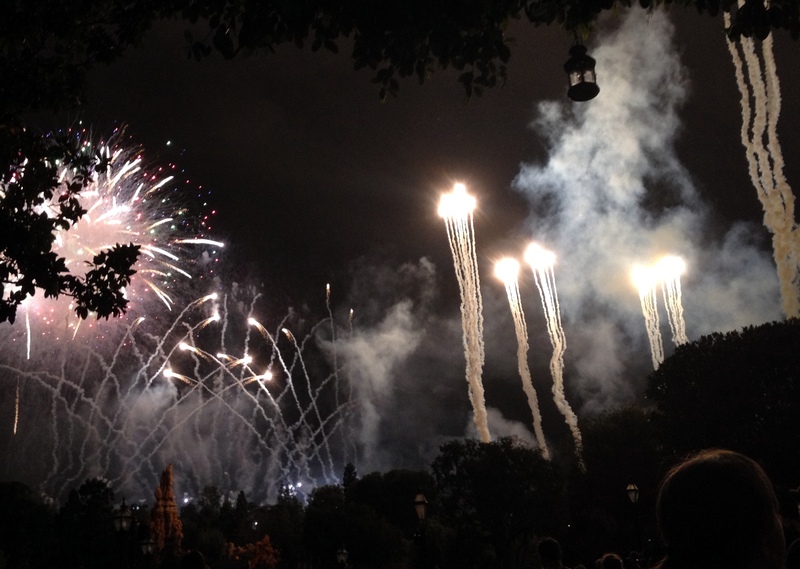 On the “dislike” end are the remainders, including every fireworks show in every park, everywhere. We found our party on the outdoor patio of the River Belle Terrace, which sits facing the Rivers of America. Fantasmic! is a standing room show that is busy even in slower seasons, so an opportunity to sit while waiting — even where the view is sometimes obstructed — is coveted. Mom, Dad, and Grandma began their table-securing vigil at 6:30 ahead of the 9:00 show, and they were not the first ones waiting. We found them at about 7:00 and settled in to wait. Jake and Valerie joined us at our table before long. Our group occupied a large slice of the patio, which was fair play for a group of 17 people with three large, cumbersome strollers. We made ourselves as small and unobtrusive as possible. The metal chairs were uncomfortable after 10 minutes and agonizing after 30, but, happily, at 35 minutes a creeping numbness set in. I checked email on my smartphone and answered a few, then went to Facebook and Twitter to see what was happening outside of the Disney bubble. My eyes began to glaze over as I power-cycled between email, Facebook, and Twitter. Amy tried to engage our table in conversation, but I had become an automaton, and Jake and Valerie were monitoring Jorja, who was sitting with Mom. At last, Amy playfully smacked the table in front of me, jarring me from my phone. “I am hungry,” she announced, smiling at my glare. I stepped into the River Belle to buy us sandwiches for dinner while she saved the table. I settled on a deli-style turkey and she went with roast beef. We both crowed with delight over the dill pickle wedge, which was a reminder of how easy we both are to please, sometimes. We were now meals: 3, rides 1. The food had given us a needed shot of energy, although now I was restless. Amy was settled and comfortable, but I was still holding a FastPass for Big Thunder Mountain. We may have forgotten about Soarin’ earlier in DCA, but I was not about to skip my single favorite ride at Disneyland. I left the group behind and all but skipped to the entrance queue. The wait time for Big Thunder, to my surprise, was listed at 15 minutes and I had an hour until the show started. I decided to pocket the FastPass for later and jumped in the stand-by line. It was so quick and enjoyable that I did it again, right after. Another thrilling performance of Fantasmic! When I got back to our corner of the River Belle, we had forfeited the table where Amy and I had been sitting to other guests, and consolidated around a smaller area. I slipped into an empty chair next to my wife and cackled that I had ridden Big Thunder not once, but twice, and still had my FastPass. She smiled good-naturedly and returned to her conversation with Stacie. Soon enough, the lights came down and the familiar Fantasmic! music started. It was just exactly like I remembered. After the show, with two hours left before the park closed, the group drifted apart once again. Mom, Dad, and Grandma strolled out through the shops on Main Street, USA and to the hotel. The parents of young children took their tired kids (and tired selves) back to bed, as well. Amy and I joined up with Rich and Hydee and drifted around the park, catching up on a the riding we missed and trying to squeeze every last, possible drop of enjoyment out of our time at Disneyland. We poured ourselves into bed that night, exhausted, but victorious. We had conquered the long, hot, crowded day. On another occasion, in another place, it might have been miserable. But, fools that we were, we couldn’t wait to get back up again in the morning and start all over again. I am loving these posts. I can’t wait to relive the rest of the trip!